Ponsford, J., Ross, P., Olver, J., Fossey, E.., Barclay, L., Hilton, G., Downing, M., McKenzie, D., Nunn, A. & Mortimer, D. Early vocational intervention for people who have experienced trauma. Transport Accident Commission, $1,757,236. Callaway, L., Tregloan, K., Bonyhady, B., Bowen, D., Gabbe, B., Braaf, S., Wiesel, I., Martel, A., Gohil, A., Lalor, A., Moore, L. National and international perspectives to inform the TAC client housing strategy. Transport Accident Commission, $198,044. Callaway, L. et al. Building and Testing Mainstream Employment Pathways for People with Neurological Disability. Department of Economic Development, Jobs, Transport and Resources (VIC), $90,000. Barclay, L., Lalor, A., Migliorini, C. & Robins, L. Research to identify best-practice service delivery and care models for spinal community integration programs (national and international). Transport Accident Commission, $68,907. The Occupational Therapy department’s Master of Philosophy student Arifa Jahan Ema, from Bangladesh, is a recently mobilised Australian Awards scholar. Arifa’s research focuses on rehabilitation after a spinal cord injury; specifically, how students reintegrate academically after such injuries. She hopes to apply her research when she returns to Bangladesh by working with students with a spinal cord injury who are returning to education. Despite only being halfway through the first year of her master’s degree, Arifa recently submitted an abstract for a paper to be presented at the 57th Annual Scientific Meeting of the International Spinal Cord Society and the 25th Meeting of the Australian and New Zealand Spinal Cord Society. These meetings will be held jointly in Sydney in September and Arifa is already looking forward to attending and presenting her paper, as well as networking with international experts, and learning about innovations and new practices in her field. 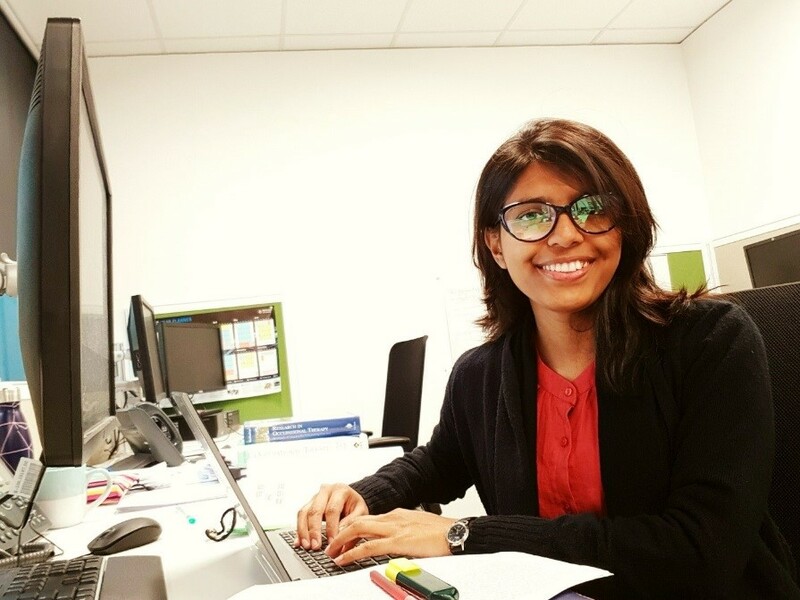 Arifa will spend the next 12 months preparing her paper, presenting it in September, planning for additional publications, returning to Bangladesh to conduct her research, and working through her results and findings. She is really enjoying her studies and has had some new ideas since starting her Scholarship. ‘I am looking into the possibility of becoming an academic in a few years, and working with my network to develop a Master of Occupational Therapy. There is currently no such program in Bangladesh,’ Arifa said. Arifa has also been busy taking part in some initiatives organised by Monash University outside of her studies. She contributed to the Monash Human Book, a book designed for occupational therapy students, in which she talked about her background and experience of working in the sector in Bangladesh. She also participated in a career conference, presenting on the reasons behind her decision to become an occupational therapist and her life journey to get to where she is today. 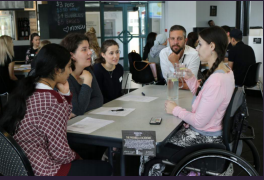 The Monash Human Library is inspired by the original Human Library project, which started in 2000 in Copenhagen, and is designed to build a positive framework for conversations that can challenge stereotypes and prejudices. The Human Library experience allows for people to connect with other people and learn in the most genuine way possible -- communicating experiences via storytelling. Our 'books' (guests from our community) openly speak about their experiences to a smaller group of individuals (our 'readers'), and allows for the readers to gain insight to their stories. These are the incidences or encounters that we might not otherwise usually have the opportunity to engage with first hand. Books expect and appreciate difficult questions to explore and challenge stereotypes and prejudices. The aim of the project is to encourage dialogue to build positive relationships between people. 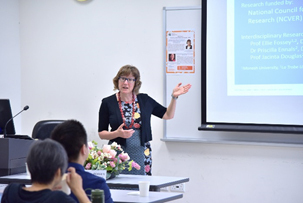 In late October, Professor Ellie Fossey and Dr. Eli Chu from the Department of Occupational Therapy, visited the Education University of Hong Kong. The pair visited the Department of Special Education and Counselling’s Integrated Wellbeing Centre (I-Well Centre), which offers occupational therapy, speech therapy, physiotherapy, psychology and counselling services for children with special educational needs and their families. Professor Ellie Fossey presented her research on the provision of supports for students with disabilities in tertiary education, and suggested implementing supports to assist these students. Dr Eli Chu discussed simulation based learning in occupational therapy education, sharing the effectiveness and values of simulation in health education. Olivia Sun and Isabelle Aubrey did a fantastic job representing our Occupational Therapy program, implementing a community garden with one of Yooralla’s disability residential accommodations. The six-month-long project involved developing a sustainable kitchen garden with the residents to help them engage in meaningful tasks and spark positive social connections. This was done by creating an accessible garden space featuring modified long-handled gardening tools, educational resources, and a photo diary for residents to track their journey in the garden as a community. Since its completion, the garden has successfully empowered residents to take on new roles. Libby Callaway (Occupational Therapy) and Dr Kate Tregloan (MADA) recently hosted a National Housing Roundtable at Clayton Campus. The roundtable bought together each of the State Government disability accommodation and housing representatives, injury insurers, and key representatives from the National Disability Insurance Agency's national office Housing and Market Commissioning Teams. Scheme Specialist Disability Accommodation Rules, that Libby, Kate and Jono Bredin co-authored an article for in ‘The Conversation’. The article examined these new rules and Jono's experience of smart technology-enabled housing, coupled with an innovative clinical training program offered by our OT students. You can read the full article here. 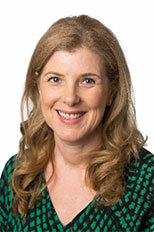 Social Services as part of the second stage implementation plan of Australia's National Disability Strategy. Kyoung Oh developed a brochure and website to assist older adults with volunteering for Impact Volunteering. 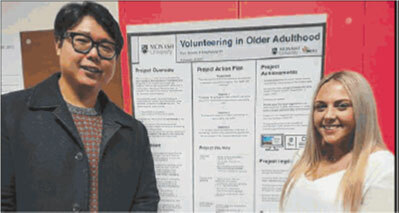 The students found that there were lots of benefits that volunteering can have on older adults. 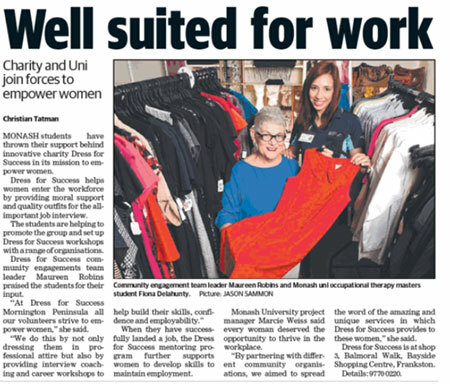 It is great to see our students building their professional identity and benefiting the community. 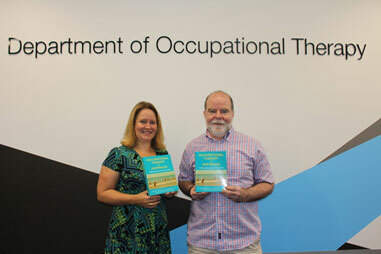 Congratulations to the Department of Occupational Therapy’s Associate Professor Ted Brown and Associate Professor Helen Bourke-Taylor who have made a valuable contribution to Australian OT education in bringing together a foundational textbook for occupational therapy undergraduates providing a guide to practice issues in the Australian context. Occupational Therapy in Australia: Practice and Process Issues (2017) is an edited book consisting of 28 chapters written by over 65 contributing authors and is published by Allen and Unwin. It is the first book of its kind written by Australian occupational therapy authors for Australian occupational therapy undergraduate and graduate-entry Masters students. The book has been adopted across the country by occupational therapy education programs as a key text. Two of the four book editors and ten of the contributing authors are from the Monash Department of Occupational Therapy. A wonderful achievement for everyone involved! Associate Professor Lisa O'Brien from the Department of Occupational Therapy and fellow Monash colleague Dr Chao Chen from Mechanical and Aerospace Engineering, have received a Monash Institute of Medical Engineering seed grant of $50,000 to improve the functionality of 3-D printed hand orthoses. Current designs are activated by flexion and extension at the wrist, and Dr Chen's students have been working on improving their ability to perform common daily living tasks, including pouring water, turning a page and handling money. With this grant, the pair hope to improve dexterity of the hand by using more of the available wrist movements, such as sideways deviation, pronation, and supination. They are also working on an adaptive mechanism for optimum grasping force and speed. Jane and their program to assist mothers caring for children with a disability. The program which the duo created in 2012, has also run in Melbourne, Sydney, Geelong, Albury and Chicago in the USA. The job for mothers who care for children with a disability, is unrelenting. In Australia, one in 12 children have a disability and in 95 per cent of cases, the mother is the primary carer. Helen explained "I'd like to see better understanding of family needs within a disability system that's becoming increasingly individualised and focused on the person who is the recipient of services. Because they don't live and exist on their own, they live within a family unit and disability affects the whole family." 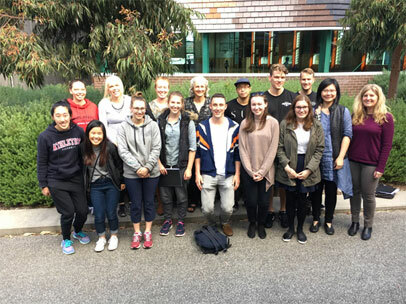 The Department of Occupational Therapy in collaboration with SCOPE therapy services implemented an innovative supervision model to provide fieldwork placements for occupational therapy students at Beaconsfield Primary School and Pakenham Springs Primary School in 2016. SCOPE “is a not-for-profit organisation that exists to support people with physical, intellectual and multiple disabilities achieve their goals in life.” Three groups of four students each from the Bachelor of Occupational Therapy (Honours) and Master of Occupational Therapy Practice programs completed fieldwork placements in these primary schools during April to September 2016. The students provided supervised occupational therapy support to students of the two primary schools at no additional cost to the schools or families, under the supervision of Occupational Therapists from SCOPE School Team Southern Division. In addition to occupational therapy students obtaining Invaluable learning experiences, their supervised work in supporting primary school students at the two schools as part of their fieldwork placements have also contributed to the students, teachers, and the schools in a very positive way. Lisa Kid, a Grade 2 Teacher, from Beaconsfield Primary School gave some feedback about the partnership. 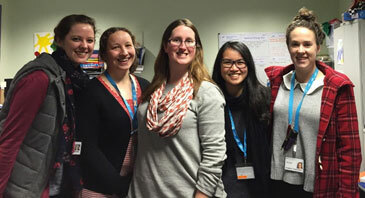 The Department of Occupational Therapy values its collaborative partnership with SCOPE, through which this supervision model was trialled for the first time this year. As can be seen, it was a win-win-win-win for Monash occupational therapy students, SCOPE, the two schools involved and the children in the schools. Dr Chao Chen and Associate Professor Lisa O'Brien have received a Monash Institute of Medical Engineering seed grant of $50,000 to improve the functionality of 3-D printed hand orthoses. Current designs are activated by flexion and extension at the wrist, and Dr Chen's students have been working on improving their ability to perform common daily living tasks, including pouring water, turning a page and handling money. With this grant, the team hope to improve dexterity of the hand by using more of the available wrist movements, such as sideways deviation, pronation, and supination. We are also working on an adaptive mechanism for optimum grasping force and speed. 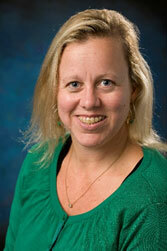 We have two consumer participants (one child and one adult) enrolled in our study to date. Both have been 3-D scanned, and the engineers are currently custom designing their prostheses. We have also recruited a prosthetist (Jim Lavranos, Alfred Health) to our team. 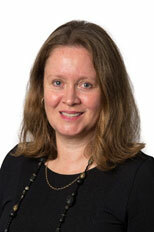 Professor Ellie Fossey, Head of Occupational Therapy, was recently successful in a NHMRC Partnership Project Application titled “Building the Evidence Base for Prevention and Recovery Care Services”. The project involves seven inter-related studies designed to evaluate the appropriateness, effectiveness and efficiency of Victoria's Prevention and Recovery Care Services (PARCS), which are residential services for people with severe mental disorders. The project represents a partnership between universities, PARCS providers, clinical services and the Victorian Government, and will actively engage service users and their carers and other experts. 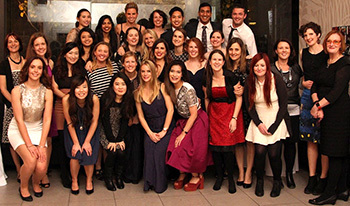 The first cohort of students from the Master of Occupational Therapy Practice (MOTPrac) graduated in July. All students were very happy to have made it through a rigorous two years of the program which runs over 72 weeks. Some graduating students have already been offered and accepted very interesting employment in areas that are consistent with their new skills. Congratulations to Linda Barclay and Mong-Lin Yu who are recipients of the SPHC Research and Research Degrees Committee 2016 Seeding Grants. 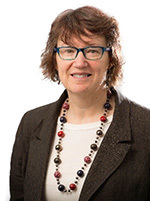 Linda Barclay's Project title is "Social and community participation following spinal cord injury: toward development of an intervention to improve health, well-being and life satisfaction". Mong-Lin Yu's Project title is "Less writing, more talking: Using Zoom videoconferencing to facilitate reflective learning during final year OT students' transition to practice".